Mark your calendars. On Wednesday, March 20th, the first day of spring, tickets will go on sale for the 2014 season of Outstanding In The Field. On September 4th Bill Taibe of The Whelk & le Farm and on September 5th Chef Wirt Cook of the Redding Roadhouse will be hosting dinners @ The Hickories Farm in Ridgefield. 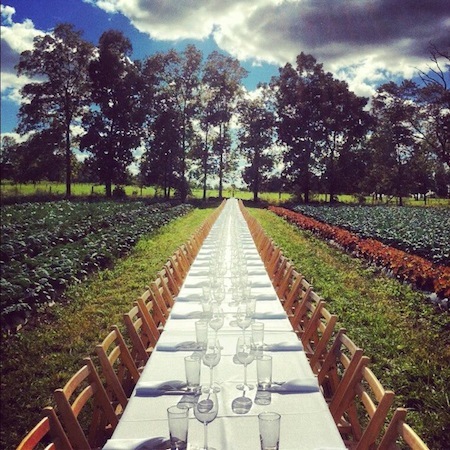 "Outstanding in the Field is a roving culinary adventure – literally a restaurant without walls." Their mission is to re-connect diners to the land and the origins of their food, and to honor the local farmers and food artisans who cultivate it. The other meaning of Outstanding in the Field is outstanding as in the best. Wirt Cook of the Redding Roadhouse completes our two-fer at The Hickories. Scouting about for ingredients, Chef Wirt will find a lot to pull or wrestle with. The farm has fruits, vegetables, goats, pigs and sheep. This is a historic farming site with a cool history. And Wirt -- you may recognize him as the sous-chef for 2013 Iron Chef champ Alex Guarnaschelli, where he helped his mentor walk away with the prize.